Dream: I should have my own show on TV, using my own lights and/or their big powerful TV lights, arranged to my design and flashed by me, it should be called Dice George Lightshow in big letters, and underneath, in small letters, the name of that week's bands, Hawkwind, The Who, Rolling Stones, RDF, Back To The Planet, Tofu Love Frogs, 2000DS, Lost In Space, Phoney American Accents, Inner City Unit, Space Goats, etc. etc. etc. 27 December 2006: did a good lightshow for Dirty Ray and his drummeress at Gretel and Bex's party a few weeks ago. Someone said they thought they looked a bit crap, the rusty tin cans, but when the music started and the house lights dimmed they could see why i built them, it's not how bright they are it's how you flash 'em! December 1999: I'm in my bus in Somerset, the lights are in the boot, two gigs cancelled - when next? In London Lord Eric Sugumugu showed me a video with bits of my lights flashing from when we were at the Rainbow Centre - waiting for the phone to ring! 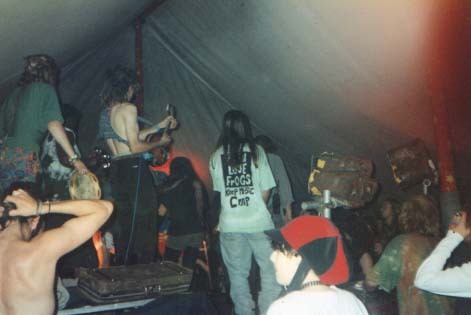 August 1999: I've done two and a half lightshows this year: the first with the Space Goats in a pub at Bristol; the second almost at the Malcolm X in Bristol, but the PA didnt arrive so I drove to Stonehenge instead; the third with my 12 volt conversion on the Mandala Stage at Pilton ... see homepage . I have left London and am now parked near Nunney, in Somerset; My Lightshow is in the boot of my bus, it needs a 13 amp 3pin plug socket, I've mentioned it a few times to friends in Glastonbury, Radstock and Frome (and to a few at Frome Festival but they didn't want it) so maybe someday a van or car will ferry it to a small pub or venue somewhere - it's the new season! I watched the lightshow at Frome festival when Misty In Roots should have played but didnt (because of money) someone tested all the lights, first playing with the moving ones, then the flashers, then projections: I got to see the works, a fascinating hour. the one time I had a go on a big lightshow like that was Pogle's lights at an Ozrics megagig in Brixton, the first band, Roly and Al's Damij, I'd done some of my lightshows with them at various squats in London, I said I was their lightshow, so I could I press the buttons please: they said OK George. I got them to turn off all the special effects, projecters, etc, just played the with the twenty or thrity buttons and dimmers, one of them (a professional) enjoyed my fingerwork. Lights is a musical instrument, with rhythm, mood and colour and intenity, there can be musical feedback of timing and feeling between the lightshow and the drummer, (and guitarists), a wild lightshow can pump energy into a band and the dancers. Thu17July1997: lights packed away in boot of bus - no gigs planned, sorry, please email and video? Lost In Space are supporting Max Splodgness Abounds on Saturday at Red Eye, Copenhagen St, Kings Cross, 8pm-12, #3.00 with this flyer.?????? There's a 50% chance they'll come and take my lights there. Phone them (0171-820-0481)? My first lightshow was built with wood and hardboard, the primary blue used to smoke if I left it on too long. In Coventry I got twenty four commercial baked beans cans from the canteen and riveted them together to become four triangles of three lights. Later I used six paint cans for two more triangles. With eighteen 150watt bulbs that makes 18x150=2700 watts, at 240volts that's 2700/240=11ish amps, they all run off a normal 3pin plug with a normal 13amp fuse, with an amp spare. Dice George Lightshow with Lost In Space at the Cooltan Benefit at the Old White Horse in Brixton. At Stonehenge Free Festivals I used to camp at the same area south of the 3 mounds year after year, so did Dave and Deb, that's where I met them. Years later I met them in South London with their band, the Totentants, later they became called LostInSpace. I've done perhaps ten lightshows with them, in ten years, I remember once I drove a dodgy van from Hackney to Brixton to do one at the Canterbury. And one at Peckham, at a semi-squtted pub in between landlords, using Mungo's car. Thanks. (See Stonehenge /findex/IGA?? How I got my lights there is mentioned on my 1996 page. Problem at the Cooltan gig was the two white lights over the bar, the barmaid needed them, but they shed load of grey light on the stage. What I like is total blackout- so when I turn all the lights off the room is black, but this is seldom possible. 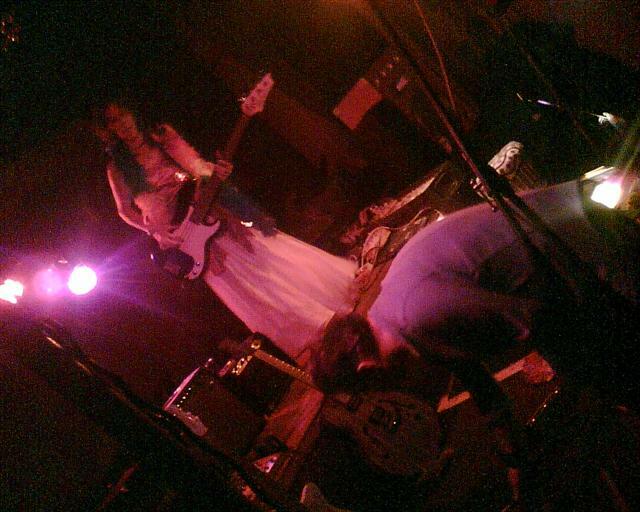 Once, in the cellar of a squatted pub near Vauxhall with Back Go the Planet and the Tofu Love Frogs years ago. Actually the Canterbury Springfoot gigwas good that way, 95% of the bar light is kept from the stage, When I got back at 6ish my light which goes behind the drum had been moved, the stage was very narrow and there were fifteen acts to come before our band , after much discussions with the drummer, the sound engineer, and two cooltanners I took them off stage and put them behind me, I needed light at the front for if Deb came off the front of the stage, as I thought she would, and she did. It was a narrow long stage, one light was at the right corner, it couldn't be forward, because people would have knocked into it. I was in front of the stage at the left by the wall, to my right was the sound desk and Lee. So I moved six lights to his right on scaffold, three to my left high on scaffold (frontstage), and the other three cans I had loose at the back of the stage by Dave's feet towards the drums, one primary red I remember, can't remember what the others were - see the video. I used the same colours as at the Canterbury, but in a different order, because what was the drumlight was now a front light. Reds, oranges, yellows, green, lime green, cyan, blue, deep blue, magenta... One day my million pound lightshow will have hundreds of colours, now I try to have 18 different colours, at different angles, and blow the socks off bigger professional lightshows. (a bad workman blames his tools). One connection to a blue was loose, It was too late to fix it so I swapped the gels with a Deep Purple. That's the science. The art was the angles, the colours, how I flashed, how the band reacted. I've got a new fan. He came up to me afterwards and said it was great what I did, Then he asked what I did. When he said 'lights' he said oh, he thought I was playing music. I said yes I was, music of lights. He seemed unconvinced. Someone else had thought there was a sound to light off the bass guitar. It goes in through my ears and eyes, through my brain and out through my fingers. With lights I've got rhythm,sometimes when I've hit my switches with energy I've revitalised a band, energised the drummer, quickened the pace. Red is girly, blue boyey. Switching between Green/Red and Magenta/Cyan is beautiful and fascinating, flashing black, red ,black, blue, random is exciting, dimmers are schmaltzy. See the video. Lost in Space had a video camera with them, I saw the film this morning, it's a bit dark because my lights are 150watt and the camera wasn't near enough, but it works. If I could get it digitised and put it here at geocities as a quicktime movie or an animated gif, then wow!. (it took me a year to do the Stonehenge Campaign's Videos page, from there stoneflg.gif was quite easy. But Kingsway College's multimedia computers were moved to from Kentish Town in the summer, I don't know where to, or if I can use it as an Open Learning student - - I did an expensive course in Adobe Premiere there last summer term when i was on the dole at Kentish Town Rainbow Centre, but stopped signing on this summer at Wandsworth Eco Village, and haven't got financially sussed since, too busy, much more important things to do. I did a lightshow in the Canterbury with Springfoot, a new band to me. After i said to the drummer I was suprised I hadn't met him before, we must have been drifting round the same circles, and I collect good kicking drummers ,like him. Great band, great lightshow, and after it all Mungo paid me £20!.